A hit 2010 Minnesota Fringe show is currently being remounted in a full production in the Guthrie's Dowling Studio Theater. 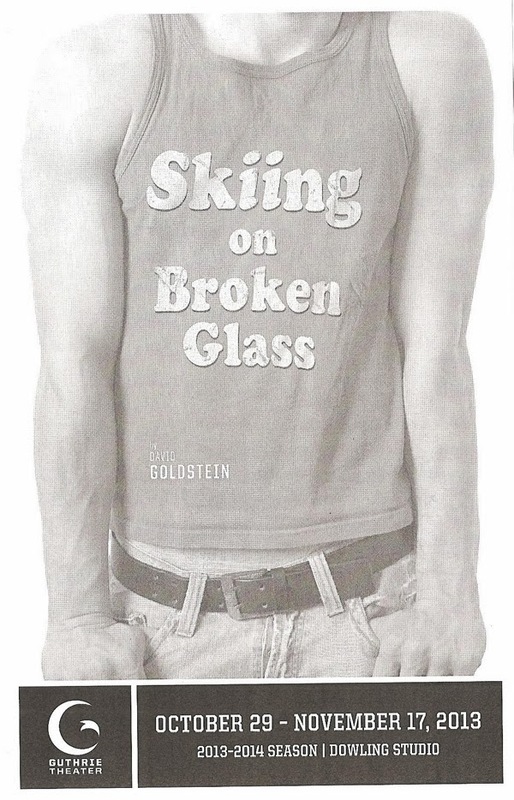 The Guthrie's Artistic Director Joe Dowling* saw Skiing on Broken Glass at the Fringe and has worked with writer David Goldstein over the last few years to develop it into this expanded version, adding characters and developing relationships. The result is a tragically beautiful love story between two very different people who need each other. With a fantastic four-person cast of three Guthrie veterans and one welcome newcomer, this is a wonderful production of a great new play. In the first scene of the play, we meet Mark (Michael Booth), a successful writer in his 40s still grieving the loss of his partner 12 years ago. He has "accidentally" brought home a young prostitute named Todd (David Darrow), and the two develop a relationship that progresses over the next several years (with the time displayed on the wall at the beginning of each scene). Mark offers Todd kindness when he's in trouble, and the two eventually discover that they love and need each other. Their relationship is complicated by the fact that Todd continues to work as a prostitute despite Mark's suggestion that he go back to school, as well as Mark's discomfort in introducing his new young boyfriend to his successful established friends. His good friend Edith (Michelle O'Neill, who directed the Fringe production) visits from London and tells Mark exactly what she thinks of Todd - that he's taking advantage of him and it can't possibly be love. She introduces her fiance Thomas (Bill McCallum) to Mark and Todd, which adds another layer of complication and tragedy. Even though none of their friends quite understand, these are two lonely and broken souls who need something the other can give. Even though they may not be able to stay together, they've changed each other's lives for good, and I think, for the better. Michelle gives a wonderful performance as the woman concerned for her friend, as does Bill as the stuffy Englishman who turns into something more sinister. But the play belongs to Michael and David as they beautifully portray this complicated relationship. Michael reveals layers of Mark as he tries to see in Todd what he wants to see, and slowly accepts who he is. The highlight of the show for me is an incredibly emotional and raw performance from David Darrow. He's a true talent, and now that he's made his debut at the Guthrie I think we'll be seeing a lot more of him on the Guthrie stages (the shirtless scenes are a great audition for the role of Spike!). The black box studio is set up in my favorite arrangement and the one that feels the most intimate, with audience on three sides of the square stage, mimicking the Guthrie's thrust stage. I think this is my favorite of the five Michael Hoover sets I've seen in the last month - a gorgeous Frank Lloyd Wright-esque home, with a living room I'd like to live in and stairs to a second floor with multiple doors. 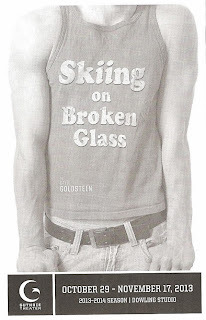 Skiing on Broken Glass is about following your heart though others may judge you harshly. Ultimately, there is no one-size-fits-all when it comes to the people we love and the relationships we pursue. And it's about the bounds of friendship and the responsibilities that come with it. At its most basic level, Skiing on Broken Glass is about the universal need to give and receive love, to have profound and selfless feelings for another person in the deepest recesses of our hearts. It is about love in all its forms: healing and hurting. Lost and mourned, Bought and sold. Vulnerable and irrational. Selfish and unconditional. Love as a weapon. Love as salvation. *Read this interview with Joe Dowling for more about the development process and casting. Sounds like a really good play - hope someone stages it in the Balto/DC area sometime soon!